When a government executive from the east coast decided to retire, she knew it was time to finally make her home in Santa Monica into the perfect restorative retreat. From a lifetime of travel, she collected an eclectic and beautiful array of art and antique furniture that needed to be properly placed in the home she bought in the 1990s with her now late husband. She enlisted the help of Sarah Barnard Design to redesign the home, entrusting her with the task of blending the unique and personal pieces of the collection with a healthy, natural and minimalist style. Sarah Barnard set out to create a home that was not only beautiful, but that would allow the owner to be comfortable indefinitely. In all areas, both space and function were taken into account in the planning stages. In the kitchen, this was achieved by rearranging the space to best fit the clients’ lifestyle. An open-plan design was chosen to allow the owner to easily cook, as well as to allow for easy entertaining of guests. The natural French oak flooring seamlessly connects the kitchen to the dining area, enlarging the sense of space in booth rooms. 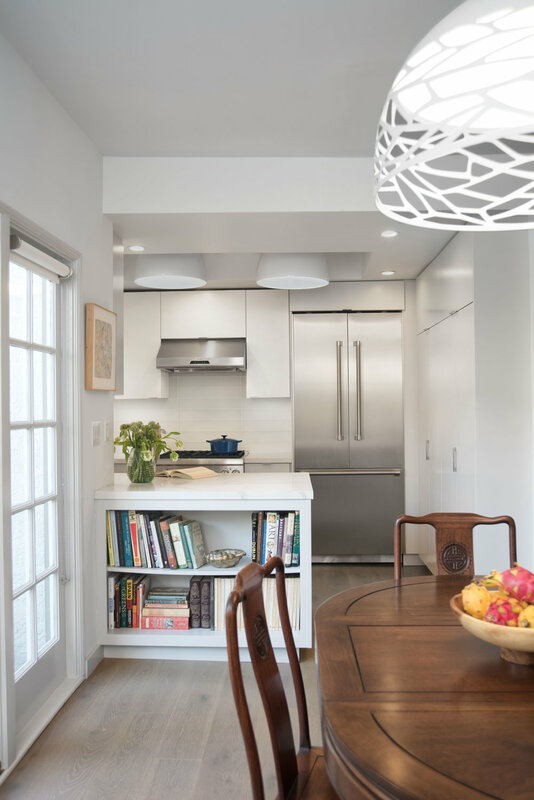 Open shelving just outside the kitchen keeps cookbooks close and adds a sophisticated pop of color while stainless steel appliances were selected to subtly pair with polished chrome cabinet hardware. The simplicity of the color palette, the clean, natural materials, and the streamlined design created simplicity and a new ease of use. Sarah knew that repurposing the owner’s treasured pieces would be essential in the home's re-design, so the owner’s antique chairs and matching rosewood table from Thailand are placed prominently, bringing warmth and history to the contemporary dining space. The Italian chandelier above it contrasts the classic style and is made of laser cut metal and glass. In the living room, the original design included a large diagonal bench that connected to the fireplace. The redesign eliminated this and other cumbersome architectural elements to create more floor space and a modern aesthetic. Sarah conceived a simpler fireplace in order to feature art and items her client painstakingly collected. A serene white plaster fireplace with a Qortstone marble hearth now anchors the living room in a place where a traditional wood and stone mantle once sat. “I had not originally contemplated changing the living room fireplace wall, but am delighted with the sleek new look Sarah achieved,” said the owner, who was also happy to finally have the perfect place for her paintings. “This oil painting, ‘Raspberry’, previously hung in the stairwell between the second and third floors where its exuberant shapes and brush strokes could not be fully appreciated.” The painting, by Wendy Edwards, now hangs neatly above the fireplace. A pair of dark stained wood coffee tables, also from the owner’s collection, were carefully chosen to make entertaining easy, while the vintage rug anchors all the white space with vibrant color. The result is a sophisticated minimalism throughout the living room. Upstairs, the owner requested an expansive shower, so the master bathroom was designed as a "wet room.” Sarah planned ahead for every eventuality in the owner’s future, including her long term health and well-being using universal design principles. The result was a space free of any barriers like steps or glass shower walls. Sarah designed the space to feel light and boundless by selecting custom cabinetry, also adding storage and architectural interest to this modern master bathroom. 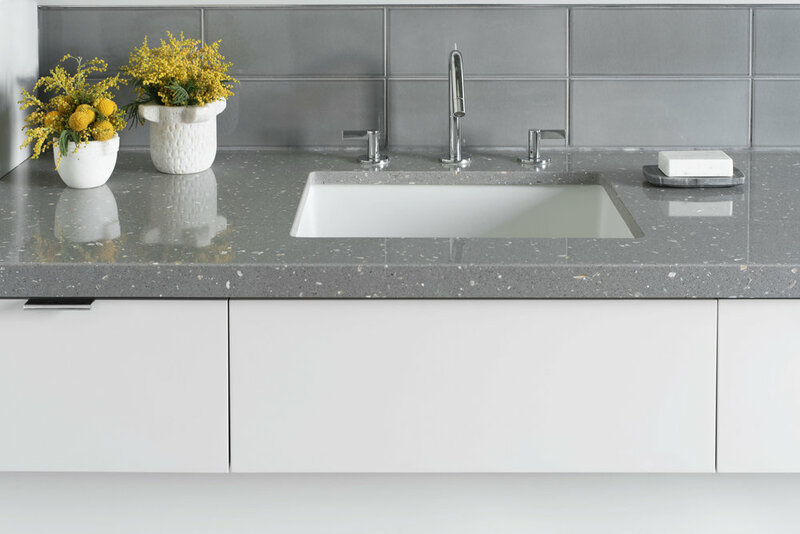 Plumbing fixtures by California Faucets were chosen for their simple beauty, while the counter top slabs contain small pieces of natural shell, echoing the nearby ocean. Sarah finds that an element of nature adds a touch of calmness. Above the counter, diffuse split disc wall sconces were chosen to add soft light to the space. Both beauty and safety were accounted for in Sarah’s design. Beautiful and sleek hand-glazed wall tiles inspired by sterling silver accompany durable and slip-resistant porcelain mosaic tile flooring, that create a functioning and timeless atmosphere. Finally, the cool and crisp master bathroom was personalized with an antique Victorian chair and a giclée print by artist D.J. Hall. The homeowner cares about her health and her environment; she practices self-care through activities like yoga and Pilates. It was important to her that her home be filled with natural materials. Sarah was careful as always to find organic and lasting materials that would contribute to her health and wellness. The master bedroom suite now highlights the beauty of natural objects and materials while planning for maximum comfort and use. 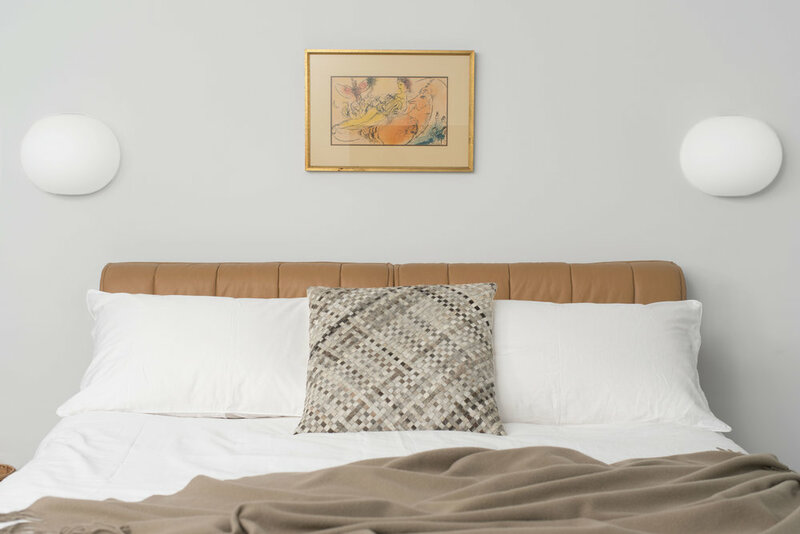 The space features a vintage leather headboard by Duxiana, and the artwork is a framed print of a painting by Marc Chagall (c. 1957). Glass orbs were chosen to provide soft bedside light that keeps the nightstands free for books and other objects. A second fireplace in a corner was made over in sterling silver-toned ceramic tiles, adding visual warmth. The marigold club chair beside it was made more personal with the addition of a handmade honey bee pillow embroidered by the homeowner. Plants and flowers dot the suite, as Sarah adds plants whenever possible to create a healthy and natural environment. The unique collection mixed with healthy materials in the design of this townhouse allowed a meaningful and sophisticated style to emerge. After the completion of this redesign, the owner explained that what she loves best about her new home is “[the] serenity of the color palette and surfaces, the bold, visually arresting scale of the principal lighting fixtures, and the way the new surroundings accommodate favorite furniture pieces and decorative items.” The newly finished home is a testament to idea that less is more, and that health and natural design are the solution to luxury. Sarah is a member of the American Society of Interior Designers (ASID), is certified by the National Kitchen and Bath Association (NKBA), and is recognized by the International WELL Building Institute as a WELL Accredited Professional (WELL AP), the International Institute for Bau-Biologie & Ecology as a Building Biology Practitioner (BBP) and by the United States Green Building Council as a Leadership in Energy and Environmental Design Accredited Professional (LEED AP). She has served on the Santa Monica Conservancy's board of directors and specializes in sustainable interior design, health and wellness and historic preservation.